Daughter of Sir Edward Stanhope of Rampton and Elizabeth Bourchier, sister of John Bourchier, Earl of Bath, and a descendant of King Edward III. Born at Sudbury in Suffolk on an unknown date, she had two half-brothers from her father's first marriage to Avelina Clifford. They were Richard Stanhope, and Sir Michael Stanhope. Through her mother, Anne was a direct descendant of Thomas of Woodstock, the youngest son of King Edward III of England and Philippa of Hainault. Anne came to court in 1511 as a maid of honor. In 1529, Sir Edward Seymour fell in love with her and repudiated his wife, Anne Filliol, in order to marry Anne, which he did before 9 Mar 1535. They had ten children: Edward, Anne, Edward, Margaret, Henry, Jane, Mary, Catherine, a third Edward, and Elizabeth. Anne had apartments at court and for a time her sister-in-law, Jane Seymour, met King Henry there. When Jane became Queen, her brother was elevated in the peerage so that Anne became, in rapid succession, Viscountess Beauchamp and Countess of Hertford. 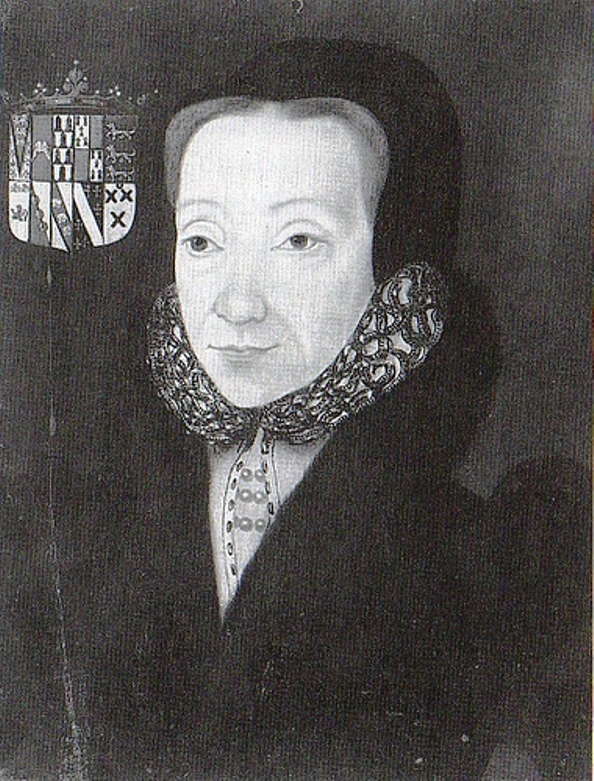 Queen Jane stood godmother to Anne's first child, Edward, who was born in 1537. The ceremony was held at Chester Place; besides the Queen, Thomas Cromwell and Princess Mary also acted as godparents. 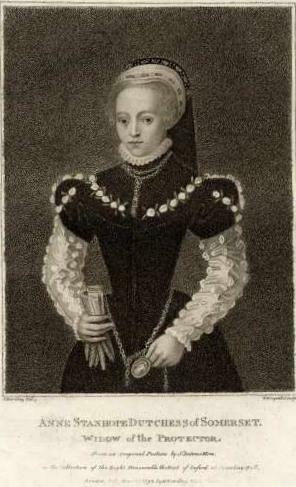 Admired by Henry Howard, Earl of Surrey, who had quarrelled with Hertford and saw him as a great enemy, Surrey, wrote a sonnet about Anne called “a lady who refused to dance with him”, which portrayed her as haughty and cold. Lady Hertford constantly made scenes in public, and she was spitefully unforgiving, haughty, grasping and bad tempered. The King visited Wolf Hall, the Seymour country seat, in 1539. Anne was present at the wedding ceremony of Henry VIII and Catherine Parr on 12 Jul 1543. Anne managed to stay on good terms with both Princess Mary and Queen Catherine but her religious leanings were Protestant. Mary Tudor was friendly towards her, and wrote frequent letters to her, addressing her as 'My good Nan' or 'My good Gossip'. She sent aid to Anne Askew in 1545, and was one of the female courtiers that Wriothesley, Gardiner, et al were trying to implicate, with Queen Catherine and lady Denny, in their interrogations and torture of Anne. Upon Henry’s death in 1547, Anne’s husband became Lord Protector for his nephew, Edward VI and was elevated in the peerage to Duke of Somerset. Anne quarreled with Catherine Parr and after her death claimed the manor of Hanworth for herself. As early as 1547, Anne was urging her husband to arrest his brother, Admiral Thomas Seymour, who had been married to Catherine Parr, on charges of treason. When news of the Admiral's marriage to the Queen leaked out at the end of Jun, King Edward publicly gave them his blessing. In the face of such an open demonstration of royal favour, an enraged Somerset could do nothing, although he had been 'much offended and displeased' by the news. Yet the Protector's wife had her petty revenge. Anne considered that the Dowager Queen forfeited her rights of precedence when she married so far beneath her station. Anne refused to bear Catherine's train, and even physically tried to push her out of her place at the head of their entrances and exits at court. Anne was quoted as having said of Catherine, "If master admiral teach his wife no better manners, I am she that will". Catherine, in her turn, privately referred to Anne as "that Hell". Anne persuaded Somerset to confíscate the Queen's jewels, which were kept in safety in the treasury, on the grounds that they were state property and could not be willed to a Queen dowager. These jewels had, in fact, been handed down from queen to queen through the ages, and some were of great antíquity, but Henry VIII had provided that Catherine Parr should enjoy them until such time as the young King married. Now Anne, Duchess of Somerset, was determined to wear them herself. Catherine Parr won the battle by invoking the Act of Succession which clearly stated that Catherine had precedence over all ladies in the realm; in point of fact, as regards precedence, Anne came after the Princesses Mary and Elizabeth, and Anne of Cleves. After the death of Queen Dowager, when Kate Ashley went to London, she heard gossip that alarmed her. Some related to the Admiral's political activities. Then the Protector's wife summoned Kat to court and berated her soundly for becoming over-friendly with the Admiral. She found great faults with Mrs Ashley because she had heard that, some time before, whilst they were still in the Queen's household, the governess had allowed Elizabeth to accompany Seymour on an evening trip down the Thames by barge without a chaperon. 'You are not worthy to have the governance of a king's daughter... Another shall have your place', she shrilled. Much chastened, and not knowing if the Duchess would carry out her threat to replace her, Ashley hurried home to Hatfield. What she had heard and experienced in London had finally convinced her that now was not the time to urge a marriage between the Admiral and her charge. Meanwhile, Anne herself was scheming to marry her son Edward to Lady Jane Grey and her daughter Jane to King Edward. Edward VI's biographer and contemporary, Sir John Hayward, described her as 'a mannish or rather a devilish woman, for any imperfectibilities intolerable, but for pride monstrous, exceeding subde and violent'. She was very conscious of her position as the Protector's wife. Edward Courtenay translated 'The Benefit of Christ's Death' in 1548, apparently with a view to conciliating Edward VI, and dedicated it to Anne Stanhope, Duchess of Somerset. The manuscript in now in the Cambridge University Library, to which it was presented in 1840, and contains two autographs of Edward VI. In Oct 1549, Somerset was removed from power and held in the Tower of London. Somerset's wife was not an altogether charming woman and has been used as a scapegoat for the duke's downfall. While he was still in the Tower, she was involved in a dispute with Mary Hill, the wife of Sir John Cheke that would tend to support her unfavorable reputation. In the winter of 1549, Mary somehow displeased the duchess, prompting Cheke to write a letter of apology on 27 Jan 1549/50. In it he tells the Duchess that he has urged Mary to “be plain” and hopes that Mary’s “honest nature” will “content” the Duchess. He also blamed Mary's behavior on the fact that she was pregnant. In an effort at reconciliation, Anne and the Earl of Warwick’s wife, Jane Guildford, exchanged banquets and festivities daily in order to promote reconciliation between their husbands, and they arranged a marriage between Anne’s daughter, Anne Seymour and Warwick’s eldest son, John Dudley, who became Earl of Warwick when his father was elevated in the peerage to Duke of Northumberland. Somerset was arrested again on 16 Oct 1551, accused of plotting against Northumberland. This time he was executed. Anne was also arrested and remained a prisoner in the Tower of London until 30 May 1553, even though she was never charged with any crime. A contemporary attack in print on the Duchess referred to her as "that imperious and insolent woman... whose ambitious wit and mischievous persuasions led him [Somerset] and directed him also in the weighty affairs and government of the realm to the great harm and dishonor of the same". Under Mary Tudor, three of Anne's daughters became maids of honor. Her oldest son, Edward, was restored in blood. Anne was granted a number of Northumberland’s confiscated properties and Hanworth, Middlesex, where she chose to live. It was at Hanworth that a romance secretly blossomed between Anne’s son Edward and Catherine Grey, younger sister of Lady Jane Grey. When the young couple eloped in 1560 and were subsequently confined in the Tower of London, Anne was careful to distance herself from them. The next year, Anne married Francis Newdigate, who had been Somerset’s steward. When her son was released from the Tower, Anne was given custody of him and also of the older of the two sons he had with Catherine Grey. Anne tried to advance Lady Catherine’s claim to the throne by backing John Hales’s Discourse on the Succession but met with little success. Lady Anne Stanhope lived a long widowhood at Shelford. 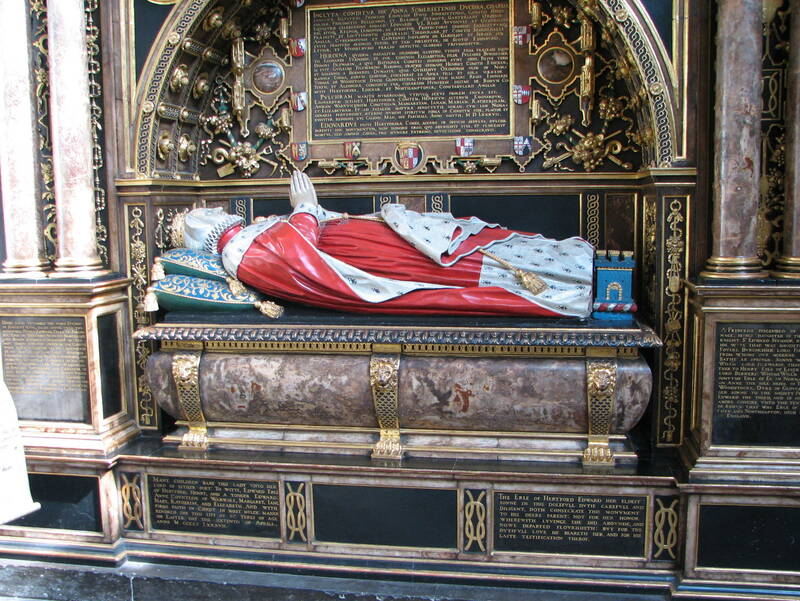 She died 16 Apr 1587, and was buried in Westminster Abbey. M.I. Will dated 14 Jul 1586, pr. 1 Jun 1587. NOTE: the DNB gives her birthdate as c.1510, Edward Seymour's as c.1500, and Francis Newdigate's as 1519.